VietNamNet Bridge – Seventy-nine-year-old former Vietnamese commando Lam Son Nao still feels uncomfortable whenever he thinks about the moment he tried to recover 84 kilos of explosives that had been left near the USNS Core aircraft carrier. Former commando Lam Son Nao, 79, proudly recalls his participation in the secret sinking of the US aircraft carrier Card. 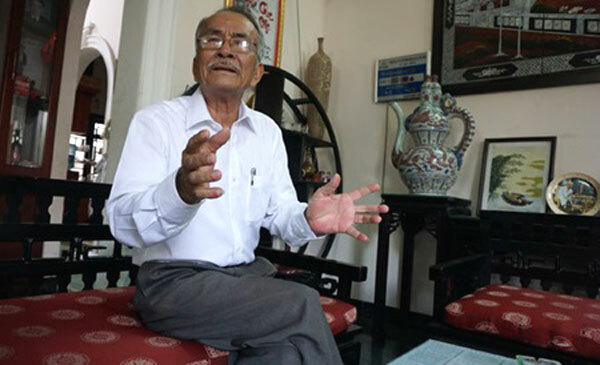 Recalling the event of 52 years ago during a recent interview at his home in HCM City, Nao said he first conducted a feasibility study for the attack by inspecting a two kilometre-long sewer tunnel three times before he and his comrade Nguyen Van Cay were approved to proceed with the mission. They later set the explosives to go off at 7pm on December 29, 1963, but they failed to detonate because of a weak battery. Nao then decided to return to the aircraft carrier to retrieve the explosives. "At that time, I thought of two situations. First, I thought if I touched it, it would explode. If I was killed, that would be OK. Second, I was afraid that the enemy would ambush and arrest me, and collect the explosives," Nao recalled. Fortunately, nothing happened, and he was able to bring the explosives back to his home. As an employee of the Sai Gon Port, Nao could operate stealthily, as his secret activity as a commando for the northern army went undetected. After the failed sinking of the USNS Core, Nao scored his biggest achievement four months later when he and others helped sink the USNS Card aircraft carrier. He has not forgotten the afternoon of April 30 in 1964, when port operator Do Toan, who was one of his three comrades, informed him that the USNS Card would arrive at the port on May 1. He was determined to destroy the Card at all costs as it was carrying several aircraft and other weapons to support the Sai Gon administration. He inspected the detonator, which included a new battery, and a redesigned bomb with 80kg TNT and eight kilos of the plastic explosive Composition C-4. "During this attempt, I intended to ask Cay to go with me, but he had a problem with his eyes, so I chose Nguyen Phu Hung, alias Hai Hung, a mason at the port, as my fellow operative," he said. Carrying the explosives past the Sai Gon Port in what was a strict security situation was a great challenge. During his previous mission, Nao said he had carried the explosives on his boat in the sewer without attracting the attention of others since he was a worker at the port and he looked as if he was doing maintenance work. "For the Card mission, my fellow operative and I pretended to be fishermen. When our boat reached Nha Rong Wharf, the police chased us to the bank of the Thu Thiem Peninsula. To avoid having my boat inspected, we pushed the boat to a swamp, so that the police boat could not reach it," he said. Nao told the police that he wanted to reach a boat to take 20 radios and clothing, and he promised that he would share some of the goods with them. He gave the patrol police 1,000 Vietnamese dong in advance and promised to give them another bribe when they returned. "By chasing us, they had (unwittingly) guarded the area for us, where we rowed our boat carrying the explosives through the sewer and put it near the aircraft carrier," Nao said. While he was talking to the police, a militia man had jumped on the boat. Nao and Hung thought they could kill him when the boat entered the sewer. "But I did not want to kill him. I told him that the goods contained much more than just 20 radios. The shipment was very heavy. I asked him to get off the boat, so we could have space for the goods, and told him that I would give him a big amount of cash later," he recalled. Everything went smoothly. The commando, named Ba Sau (crocodile) since he swam well, dove in the water to tie the explosives to the carrier in two places. He set the explosion to go off at 3am that day. Just 15 minutes after both of the men arrived home safely, they heard a big explosion. "I saw that the whole area near the port was dark. The next morning, four of us went to work normally as if nothing had happened the previous night," he said. Nao said at that time he knew the carrier was a prestigious American ship, but it was only later that he learned of its storied history. The aircraft carrier had played a significant role in destroying 11 German Navy submarines during the Second World War, he said. The Card sank 48 feet with high casualties. The explosions also destroyed 23 military helicopters and jets, Nao said. The happiest moment for him was when he heard the voice of President Ho Chi Minh and General Vo Nguyen Giap praising the victory on the radio. Asked why he chose to be a Communist commando, the native of the city's Nha Be District said that several people in his family had died during the resistance war against the French. His family's poverty was one of the reasons as well. "Working at the port every day, I saw American vessels unloading numerous weapons, including tanks and fighter jets, to support the Sai Gon administration killing Vietnamese, so I decided to do something to stop them," Nao said. Nao, who began working for the port when he was 17, registered to become a commando and later was assigned to return to the port for the secret mission. His father, who had worked at the port facility as a tradesman, was the person who suggested that he use the sewer during the secret mission. "When I decided to be a commando, I was determined that I would die and even die without a name," he said. Between 1963 and 1965, he and his fellow commandos took part in 18 battles. He was jailed and tortured between 1967 and 1973 after being caught by a counter-espionage agent. His final tasks as a commando occurred in 1975 during the last days of the war. On April 29, 1975, Nao and other commandos under the instruction of Tran Minh Son, chief of staff of the Sai Gon-Gia Dinh Commando Group, were asked to protect the Sai Gon Bridge and force the enemy to release their guns while other commandos and troops triumphantly entered the Independence Palace the following day, signalling the end of the war.